I was able to download videos from the internet, but now I can't find them in my RealPlayer Library. Where did they go? 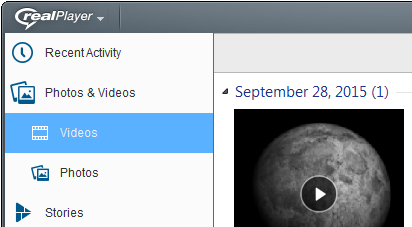 Typically, videos downloaded with RealPlayer's Download This Video button go into the Videos folder in RealPlayer (RealTimes). They can also be seen in Recent Activity. If you still can't find the videos you downloaded in your RealPlayer Library, they are probably in your computer's Downloads or Videos\RealTimes\RealDownloader folder. Downloads may go into the Downloads folder instead of the library if the download is incomplete or can't be played back by RealPlayer.